Our signs have a NEW LOOK - RED, WHITE & BLUE! 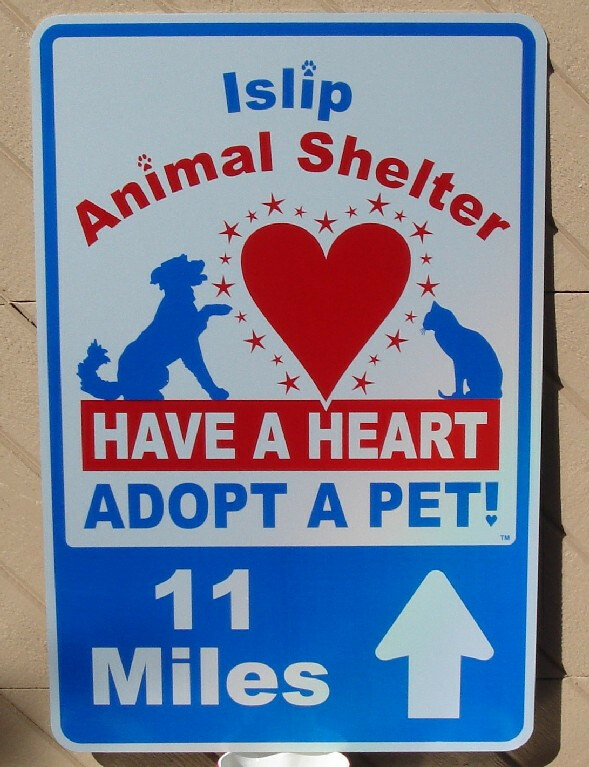 Our street signs are designed to drive traffic to local shelters. Many families choose to adopt from breeders, pet stores and organizations that import dogs from out-of-state simply because they are not aware of the location of their local municipal shelter. It is an integral part of our mission to highlight local shelters as a viable alternative to commercial adoption. Therefore, we will work side by side with your shelter to create custom street signs using our logo to alert the public to your location. You have the ability to decide what each sign says, where they will be located and how many signs are required. Each sign will have the shelter's name clearly printed at the top, followed by our logo (containing a cat, a dog or both). Lastly, you have the option of a directional arrow, an arrow with the distance noted in miles, or text. Where Do They Go? - It is important to draw traffic towards your shelter from a main road or thoroughfare. 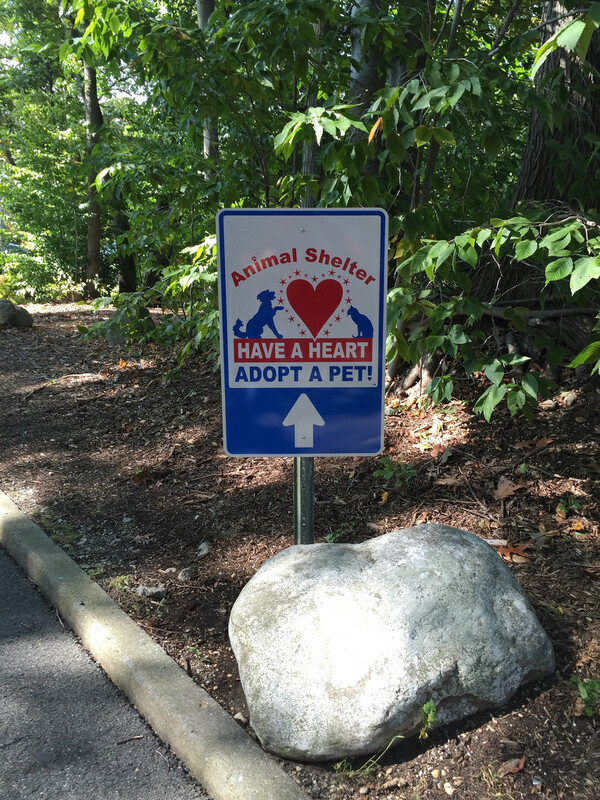 Signs should also lead visitors to your shelter from more than one direction. How Many Signs Do We Need? - The further your shelter is from a main road or thoroughfare, the number of turns and the number of paths potential visitors may take will impact the number of signs you will need. What Does it Cost? - Nothing! We cover all costs incurred for the design and purchase of our signs for each participating town. Signs located on county roads in Suffolk are supplied and installed by the county. Who Installs them? - Your municipality will install the signs promptly. Suffolk County - Our signs are currently located on county roadways. 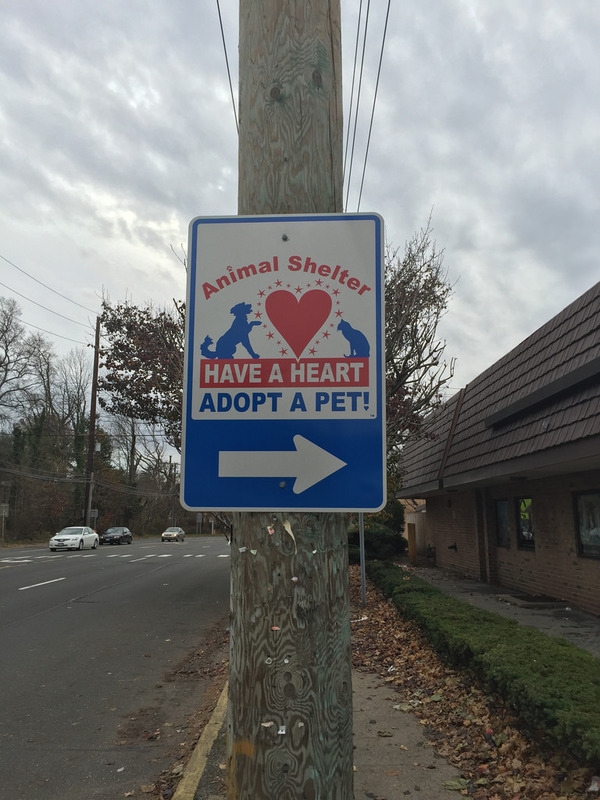 Interested In Posting Have a Heart Street Signs In Your Municipality? Contact Us! We can also special order banners and bumper stickers to suit the needs of your town. Please Click Here to see more examples of our Have a Heart signs, banners and bumper stickers.